The Irish Draught Horse is one of the two native equine breeds found in Ireland. Its ancestry is unclear. 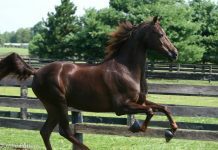 Thoroughbred stallions may have been put to local mares whose origins were a conglomeration of whatever swam to shore after shipwrecks (perhaps from Spanish galleons) and French and Flemish stock brought by Anglo-Norman invaders. The Irish Draught was more likely developed from local horses and adapted to the work that was required. Historically, the Irish Draught breed was an all-around utility animal for the Irish farmer. 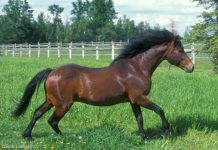 Today, the Irish Draught is often crossed with the Thoroughbred to produce the Irish Draught Sport Horse, a faster, smaller horse with all the wonderful attributes of the Irish Draught. The Irish Hunter and other Irish Draught crosses are successful in the show jumping and eventing world. The average height of the Irish Draught is 15.1 to 16.3 hands high; any solid color is acceptable. This powerful looking breed acts the part with bold, strong, ground covering movements. The Irish Draught possesses natural jumping ability, and due to its kind and intelligent nature it is easily trained.